A lot of people are scared of cloth diapers. To them, it means extra laundry, carrying around soiled diapers, and leaks. Well, the good news is that cloth diapering has come a long way since the 80's, and you no longer have to fold, use pins, rubber pants, and deal with leaks. Cloth diapering can be affordable, practical, and easy, as long as you're prepared with the right products and knowledge. 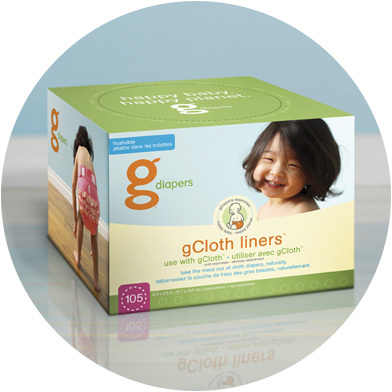 I receive gDiapers e-mail alerts, which introduced me to one of their new products: gCloth Liners. The e-mail (and gDiapers website) talked about the benefits of using the liners, but I failed to see how they would be useful, so I was hesitant to purchase any. My current system was working perfectly, and I didn't see a need for change. One day, while we were out purchasing some gDiapers and gCloth for some friends' shower gift, Clinton and I decided to get a box of gCloth liners from Babies R Us, and try 'em out (they sell them in-store, but not online). I figured that it was only $8.00, and if they turned out to be un-helpful, it wasn't too much wasted money. So I began testing them at home, just to see how they work. The liners are packaged very cleanly, dispense one at a time (like a box of facial tissues), are easy to install (just stick 'em on top of your cloth liner), and flush nicely. They contain poop quite well, and make for simple clean-up of messy diaper duty. The wet just soaks right through the liner, while the poop stays on top. I give them an A for functionality and ease of use. However even taking into consideration their handiness, I immediately found that it was nearly pointless for me to use the liners while at home. As a stay-at-home mom, I have unlimited access to laundry stain spray, a sink to rinse the dirty diapers, and a washer and dryer to clean them. But since we travel a LOT, (and always use gCloth while we're out!) I had the opportunity to use the liners on the go quite soon after purchasing them. When we were out-and-about, I always hated carrying around poopy diapers, and even with our wet bag, it was still a pain to transport eewy, stinky gCloth. This new product made it much easier to just scoop up the liner and flush it! No more poopy mess to tote around, and no expensive investment to achieve this! I would recommend that any gMums or gDads who use gCloth while you travel should purchase a box of the liners, and throw a few into your diaper bag. They're a cheap and easy solution to a yucky problem. Traveling with cloth diapers can be challenging... if you let it be. At first, I was hesitant to go anywhere with Lucas in a cloth diaper. I worried that we'd be in public, he'd poop, and I'd have a stinky diaper to tote around. So anytime I went out in public (with the exception of our daily Robotics meetings), I'd put a disposable liner in Lucas' gPants. My Newborn bundle came with a TON of biodegradable inserts, so I figured that I might as well use them! It was nice because I could just flush the yucky insert, or throw it away in the bathroom of whatever-public-place we were in. Soon after we started Lucas on solid foods and he was wearing a size Medium gPant (which happened around the same time), his dirty diapers were much less difficult to handle. Solid poops were easily flushed down the toilet, leaving the liners nearly clean (and not stinky!). I started using cloth pretty-much all of the time, including whole-day trips away from the house. I stopped using "regular" disposable diapers, with the exception of two or three-day trips away from home. But then I was faced with a little problem: what to do with all of the wet diapers? I was using powder-scented disposable diaper sacks (which you can buy just in about any store's baby section), but only a couple small items would fit in them, and it was getting a bit expensive! So, I did some research, and found out about reusable wet bags. I went out the next day and invested in one, and started using it right away. A wet bag is a cloth bag with a thick, nylon lining, that zippers shut at the top. My bag is machine washable, so I just dump the dirty diapers in the washing machine, and toss the bag in with them! The best part of the bag is that it hides the smell of the soiled diapers! Plus, it's large enough to hold a whole day's worth of dirty diapers, clothes, bibs, and anything else that you would wash. The bag I purchased is made by Munchkin, and you can buy it at Target, Meijer, or lots of other stores. Other companies make them, too, and they run anywhere from $10 to $20. Very much worth the investment! After you've primed your gDiapers for the first use, caring for them is quite simple. Diaper Jungle has a website that outlines which detergents are safe for cloth diapers, and which will extend the life of your investment. Click here to see their comprehensive list. I received a gigantic bottle of Dreft at my shower, so that's what I began to use when washing Lucas' diapers. While Diaper Jungle puts Dreft low on the list of recommended detergents, I've had nothing but success. Many of the "Free and Clear" detergents left the gCloth inserts smelling weird, while the Dreft seemed to clean well, and leave a fresh baby scent! Even with Lucas' sensitive skin, Dreft worked great! After my ginormous bottle of Dreft ran out, I did some math, and found out that Dreft is practically the most expensive detergent I could purchase at my local grocery store! I began looking at the ingredient label, and comparing it to similar products. I found Purex Baby brand soap, which was 1/3 the price per unit. I bought a bottle, thinking that $3.00 wasn't a bad amount to spend on a trial run. As it turned out, the Purex brand works just as well as Dreft, and was a much more affordable option for my family. I spray each of Lucas' dirty and wet diapers with stain spray before tossing it in his laundry basket. I make my own stain spray by combining 1 part baby laundry soap with 3 parts water in a spray bottle. This keeps his laundry from stinking up our house in between washes, and makes doing Lucas' laundry much easier.